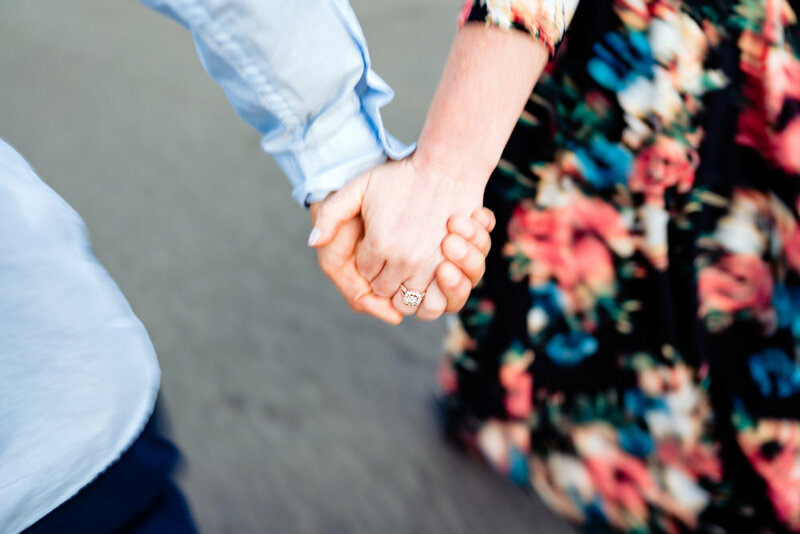 When Laura and Darin reached out about wanting a cherry blossom engagement session, we were all too happy to take part! The famous Washington DC cherry blossoms are iconic, and this engagement session from start to finish was one for the memory books. Laura and Darin are adventurous types. They were planning on being in Washington DC the day following their engagement session to run a race, so we decided to go take advantage of the gorgeous weather the day before. Up for anything, they started their journey in Baltimore to meet us in Washington DC. We left North Carolina, ready for a 3-hour drive but that drive turned into 6 plus hours thanks to typical DC traffic. It seems like a lot of people wanted to see the cherry blossoms like us! When we finally got to DC, we were ready to start capturing Laura and Darin’s cherry blossom engagement photos. But first, we had to stop at Union Station, which gave us some amazing opportunities to highlight the unique architecture and give Laura and Darin some truly amazing images. Union Station has been in use since 1908 and has seen every version of public transportation that you can imagine. Its timelessness and enduring nature is the perfect symbol of everlasting love, which made it the perfect starting point for the engagement session. From there, we moved on to Staten Park, where we explored a bit and found some beautiful, blooming Washington DC cherry blossoms. Staten Park was a perfect location to photograph the session Laura and Darin were looking for. The cherry blossoms were falling like snow as we walked around and Laura and Darin were having the time of their lives playing among the trees. While Hains Point and the Tidal Basin are often highlighted as the best places to enjoy the blooms, we thought Staten Park would be more quiet and intimate. We may have been wrong, but Laura and Darin enjoyed themselves, and so did we during their cherry blossom engagement session. After Staten Park, we did migrated to Hains Point and then the Tidal Basin area. Laura, Darin and I arrived at Hains Point just in time to capture beautiful sunset shots along the river and improptu fireworks display. From there, we moved onto the Tidal Basin where we captured some beautiful nighttime portraits that capped off an amazing Washington DC engagement session that was more magical than we had ever imagined it would be. Despite the traffic getting into DC, this cherry blossom engagement session turned out to be one of our favorite sessions yet this year.